nowadays small-scale industries and business owners of larger enterprises moving their campaigns to live Video marketing. It gives three times loner live video compared to Facebook live Video. So people driving to Live Streaming video on YouTube. 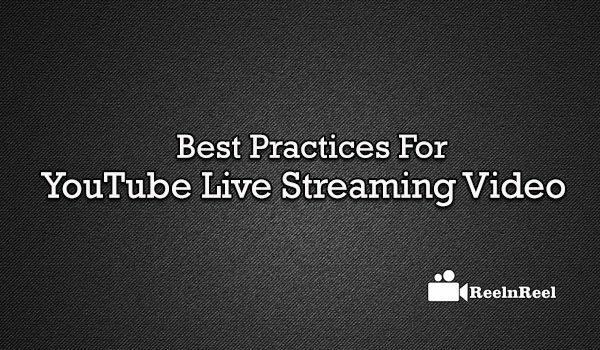 YouTube Live Streaming Video best practices can be found here. Live online video is exploding, and many more social media channels are offering this technology. YouTube being the most significant marketplace for video, reserves its priority for marketers. 1) Multiple workflows provides better results. Operating through a single channel might not give the much-expected result whereas operating through multiple channels will give the desired results. 2) Using appropriate technology gives the best output, and the video will more like by the viewers. There are methodologies to use multiple videos (depending on the requirement) and using a switch will provide all the more attractive video. Though there are multiple brands offering video switches, you need to find out the best switch within your budget. 3) Encoding the software and hardware is required. The video needs to encoded into streaming at some time or the other. Encoding is done mostly at the place of incidence, but it can be done later ‘offshore’ as well. There are free (like Adobe, Ustream, Livestream, YouTube etc.) as well as paid software encoders (Telestream’s product Wirecast Pro coming at prices less than $1000). Hardware encoders are available at a cost of $10,000 to $50,000. 4) Format and bitrate to encode and distribute need to be finalized. Arguers are supporting single stream and multiple streams onsite. While single streaming comes at economical prices, multiple streaming requires more expensive encoders and higher bandwidth causing increased cost of production. 5) Getting the video out (getting the video signal from the live event venue to a server that is doing remote streaming) is the most important and potentially challenging. Using public ISP is the common & cheapest approach. However, there are other options of using a satellite, fibre or of course the cellular technology. 6) Live streaming with closed captions: The FCC defines ‘near live’ as a program that recorded less than 24 hours before it is shown on. As such live streaming must be captioned on the internet. 7) Proper testing of a live streaming video is to be done. You need to ‘test, test and test some more’ to ensure that the streaming is working to all your end user devices. 8) Start the webcast earlier than the actual event starts. Promoting the player and URL much before the event will add weight to your streaming. 9) The conclusion of the streaming also requires proper attention. Streaming service providers offer the ability to program a reply. 10) Always have ‘Plan B’. Despite the best planning and execution, there are chances of failure. ‘Plan B’ will reduce your chances of failure and enables quicker recovery as well. According to some studies, our attention span is 8.25 seconds. In this short span of time, how to capture the attention of audiences and to keep them engaged with YouTube live streaming? Live streaming is different than the usual videos that audiences watch online. Studies suggest that live streaming watched by people for more than fifty minutes. However, this need not be the same for all. Here are some tips that can be followed to increase engagement of audience during live streaming. 1. Asking the viewers some questions will help keep them engaged. 2. Encourage the participants to discuss things in the sidebar. 3. Let the audience understands complex things by clarifying the doubts of the audience. Clarifying doubts can help involve the audience and stay them engaged. 4. Make the audience feel the live streaming important by sharing some special information that will only be available exclusively for a brief period. 5. Let the audience know about your live streaming at least two weeks before schedule. Promote the event through social media, through emails etc. 6. The next live stream event can promote during the instant live streaming. This can increase subscriptions. 7. Choosing the correct day and time for live streaming is also important. Few days in the week such as Mondays and Fridays are not good for live streaming. 8. The live streaming engagement can be increased by recording the event and sharing it with people who might have missed it. 9. Try to greet the returning viewers. This helps in building a sense of community. 10. When some new person joins you try initiating the conversion to make them feel at home. Focus on the quality of the live stream and improve with every stream the subscribers will come back if they find the stream interesting. As YouTube live streaming is gaining increasing popularity, the marketer can plan and take maximum advantage of this social media. In this article, we have shortlisted ten best ideas for YouTube Live Streaming Video for better Growth of Your Business.